I coordinated and lectured ECE3091 Engineering Design at Monash university during semester 2. 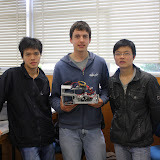 The unit required teams of 3 students to design, build and test autonomous robots aimed at one-versus-one competition. More details available from the Unit Wiki. The unit was very well received, receiving good student evaluations and comments as well as drawing a large number of onlookers for the robot contests. All teams were able to produce a robot that could move autonomously, deal with obstacles and flip foam pucks intelligently to a pre-designated team colour of red or blue (goal of the contest).